Chronicles of a Wandering Musician: Some thoughts. I know it's been a while since I have posted, but lots of things have happened in the last few months. Here is a little taste of some of the things I am going through right now. 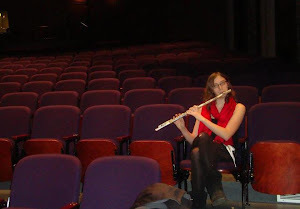 After devoting six years of my life to the study of music and philosophy, achieving a Bachelors degree, philosophy minor, and Masters degree in flute performance, and now attempting to enter the professional world I have encountered many a raised eyebrow. Most people simply ask how I, a semi-professional musician, expect to be able to repay my student loans. They wonder why I would waste six years of my life on degrees that are unmarketable except to very specific positions: orchestral musician, collegiate music educator, freelancing musician, or private teacher. They argue that none of these positions have job security, high pay rates, or the potential to support me, my student loans, and on top of it all a car payment, insurance, rent, a phone bill, and food. What a mess I have placed myself in, they exclaim. And lately I can’t say I haven’t had moments where I agree with them. Everyone suffers from moments of self-doubt, uncertainty, and to be completely frank fear. As a classically trained musician who is questioning whether that is the future she wants, I have definitely experienced many new doubts and worries in the last few weeks. But through this turbulence I can feel myself getting closer to my destination. I have recently started hiking and “climbing” at Vedauwoo, an awesome rock formation near Laramie. I put climbing in quotes because I haven’t been throwing on a harness and climbing up sheer rock faces, but I also haven’t simply been walking around the awesome rocky outcrops. Instead I have been hiking up them, climbing over and under massive boulders, and fighting to reach the tops of the formations. This is extremely rewarding both physically and mentally. Knowing that I’m capable of pulling myself up and over a giant boulder, climbing up a tiny crack and crevice, crawling under a huge rock, and essentially just exploring and having a good time at 8000 feet above sea level is a rewarding physical activity. But the mental rewards almost outweigh these physical ones. In my time at Vedauwoo I have learned that sometimes to reach the top you need to descend down the mountain, in order to get from point A to point B you have to walk in a roundabout manner and land at point C first. I have learned that you need to creatively assess the situation in front of you and sometimes, often in fact, take what looks like the more difficult path in order to reach the top. Sure the easy looking line might make it to the top, but it often hits a dead end at a cliff or sheer rock face, so rather than take that path, one might need to take the scary and impossible looking route instead. I didn’t start climbing (yes we will call what I’m doing climbing despite the linguistic complications of the word) with the intention of finding some cliched sensation of inner peace, but this is exactly what I have found. I have realized that, despite taking one path up until this point there is exactly nothing holding me onto this path. I’m not saying music is a dead end, or a fatal drop to the rocks below, but I have realized that I can stray from this path and still make it to the final destination at the top. My studies of music and philosophy have made me a complex and unique person with many different marketable skill sets. My 8+ years in the fields of customer service as a cashier at Fleet Farm, a cook, a server, and ultimately a bartender have given me invaluable insights and life skills that are essential for every field. All of the work I have devoted in the last quarter of my life has brought me to an interesting new place and I can go many places from here. I have no regrets with what I have done with my life so far and I am definitely not limiting myself in any way to this field. I will continue to pursue music because I love it and maybe someday this will take me somewhere extraordinary and unexpected. But I will also start to pursue my passions in other fields: humanitarian efforts, cultural exchange and discovery, and environmental concerns are all things that I have been passionate about my whole life, so perhaps now is the time to tap into that passion and try to find a career where I can have an impact on these elements of the world. Being a musician, a bartender, a teacher, and a student of philosophy all have one main thing in common: the desire to alter the experiences of others in a positive and impactful way. I have always wanted to make others happy whether through my music, my service, or my educational approach to students, and this desire is going to continue to mold my approach to the world. So for now I’m going to make a list of what I have to offer potential employers. This is a first draft and will continue to grow as I reflect on my experiences so far, but it has been an intellectual exercise that has helped me find peace with my current situation. I have been blessed to be given the opportunities in life that I have and it is time to recognize what I have to offer the world. · the advanced musician can’t simply expect their teacher and colleagues to hold them to a higher musical standard, instead she needs to force herself to continue to work hard in order to obtain her goals. § this might also be why I, as a musician, am loathe to enter a workplace that doesn’t have a mission that I believe in or agree with. Working for a bank or something of that nature does not appeal to me nearly as much as working for a humanitarian organization such as the UN or UNESCO. o Working as a cook, server, and bartender instills customer service skills of epic proportions: one must do the best that one can do in order to keep the customer happy and satisfied. o Multi-tasking! One simply does not cut it as a server/bartender or as a cook without the ability to multi-task. § A bartender often needs to balance all of these things, making sure each customer has the drink they want, mixing it to their specifications and to a high quality, being aware of all of the customers present as well as the new ones that come in. There is nothing worse than a bartender who is unaware of her surroundings and who doesn’t acknowledge you when you are a new customer at the bar: effective bartenders are extremely aware of their surroundings and capable of balancing the needs of everyone present.